"When I took a management position at my new job I had to make a choice, ride transit and risk losing my job due to the fact that I can't reliably say when I will be at work, or take cabs to and from work every day at $15 per ride and have no extra cash for myself. I chose the latter and it is not fun, I spend more than $600 in a month now for taxi service and it's killing me. We as workers run the infrastructure of this city so we need to be able to get to work to keep it up!" "I honestly don't know why this hasn't already been done. 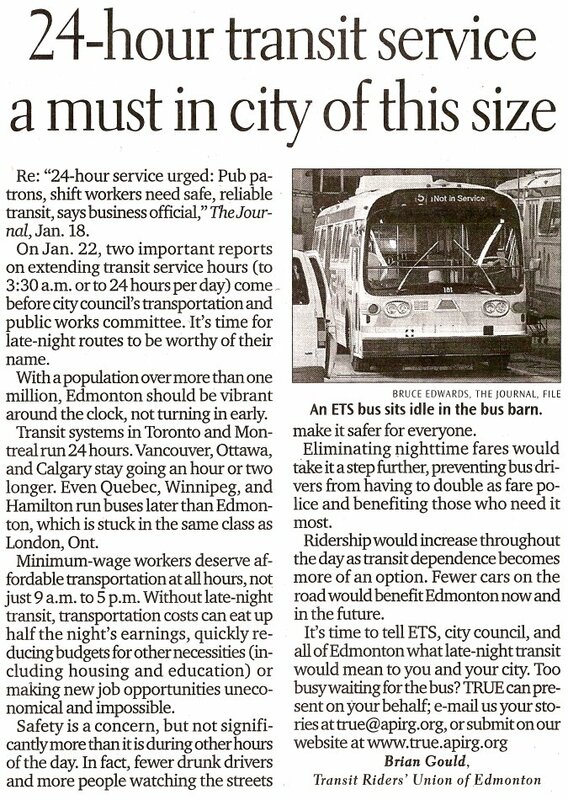 Does the City not realize that there are thousands of people working nights, every night? I know I've turned down many a good night shift job, simply because I don't own a car, so I wouldn't have the means to get to the job, and back home." "I've had to swallow many a $30 cab fare to get to work for 7:30am on a holiday at my most recent job, and I had a weekly $10 cab fare to get to my 6:45am shift every Saturday at the job previous to that. It's a little ridiculous to have to pay 1-2 hours in wages to get to work on time just because the buses aren't running that early. It's not like I was working at 4am. People still work on weekends and holidays. 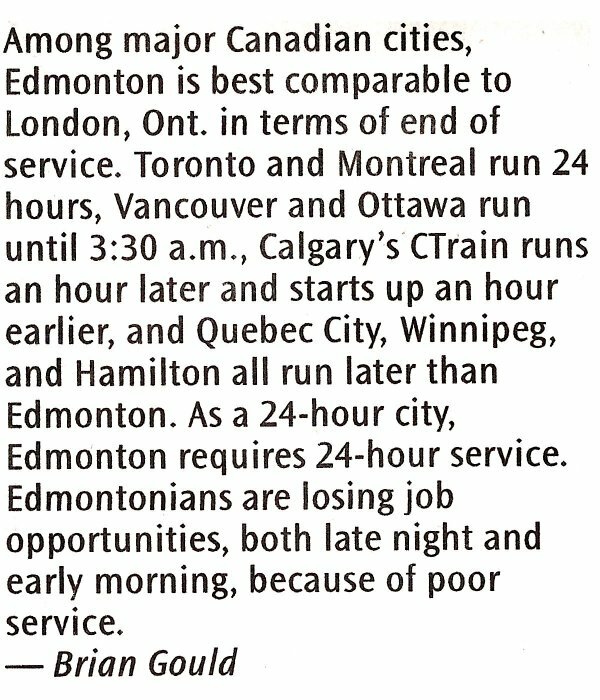 I think 24-hour service is still necessary, perhaps with reduced frequency. I don't mind leaving ridiculously early if it means I still get to eat that day." "I don't think the City realizes how many people in the hospitality industry they're currently shafting by stopping service so early. The people working in the bars and in the restaurants are generally young people or other people with not a whole lot of income... We need those buses running at the end of our shifts!" 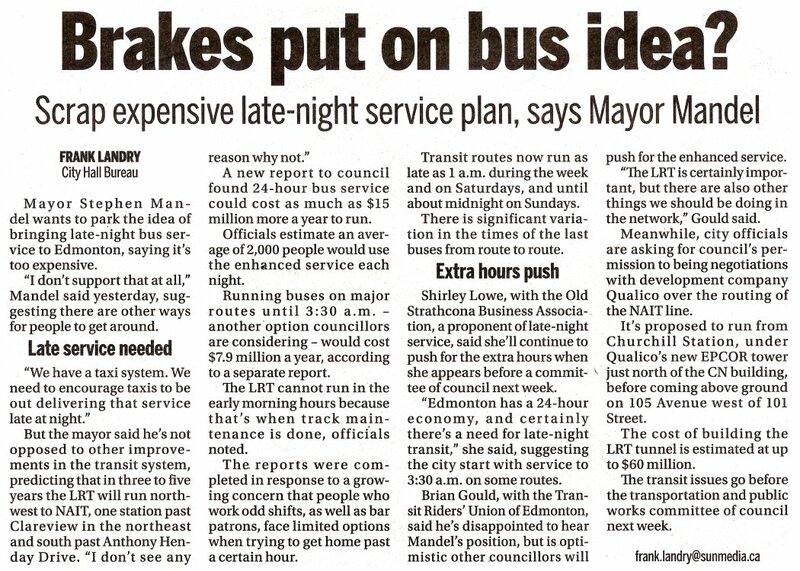 "Because transit is my only form of transportation, unless I beg someone for a ride, I am unable to be out past midnight on the weekend or during the week. I know that in the industrial area shifts do not always start at midnight. Besides we are not a little city of 500,000 any more. We are a major metropolitan city that operates 24/7." 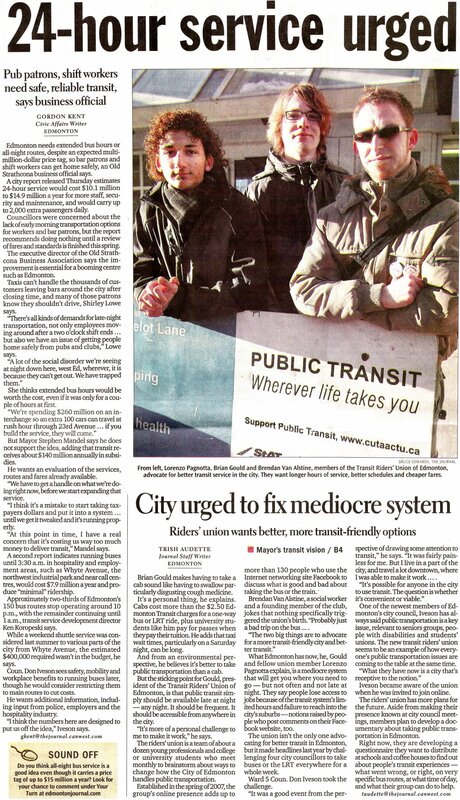 "As a long time university student and Edmonton public transit user, I firmly believe that Edmonton needs a 24 hour transit system. As a growing urban metropolis, Edmonton must keep itself in-line with other such cities around Canada and around the world. 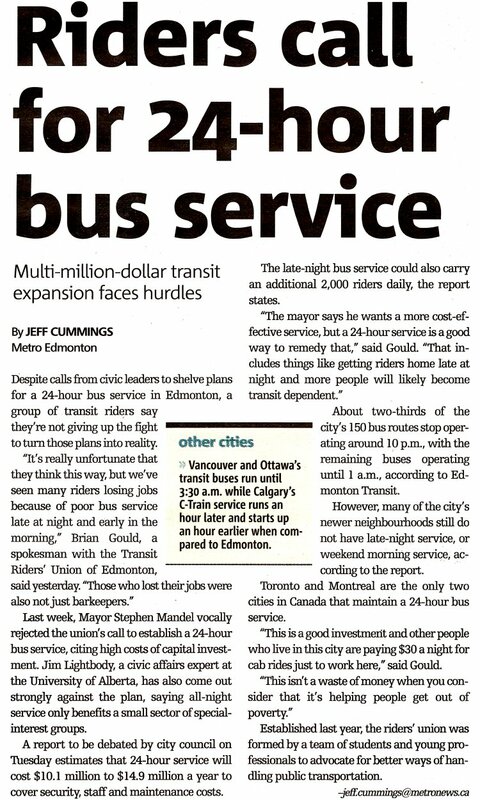 Edmonton is quickly becoming a 24/7 city, and its transit system should attempt to keep up with Edmonton's dynamic growth. Also to consider is the reduction of impaired driving charges throughout the city, but particularly in the Downtown core and Whyte Avenue areas." "I've lost jobs and been turned away from jobs because of my dependence on transit, but it was because of the lack of early morning service rather than late night service, particularly on the weekends. A lot of places want people to be available to start work at 6am. The first bus that goes by my house is at 5:30. It's usually after 6 by the time I get downtown to transfer to another bus, never mind get to a worksite. At my last job, my regular shift started at 7:30. I had to catch the 5:30 bus to get there in time. On Sundays and holidays, that bus doesn't run until 30 minutes later and I would have to either be 30 minutes late for my shift or pay more than 2 hours in wages ($30) to be on time. My previous job, when I was living in Jackson Heights, was a similar situation. I could get to work for 6:30 on a weekday but I had to pay $10 for a cab ride (1 hour of wages) or be 30 minutes late on a weekend." "I can go out to the bar but I can't get back home, it's like the city is promoting drinking and driving..."
"I will say that it was annoying when I was working for a company in the Research Park (by South Common) and had to take a training shift or something that went until midnight. Without the company shuttle to Jasper Ave, there's no way I would have been able to get home. That shuttle is being cancelled as of January, by the way. If the shuttle was a few minutes behind schedule, I would miss the last route 1 heading west, and instead of the 6-block walk from Jasper Gates to my house (I would only have 1 block if the 2 were still running), I had to walk all the way from Commerce Place. That's a long walk, especially for a female late at night. And especially in the middle of the winter." "The industrial areas are serviced only during peak hours. Which means that if you need to go to an appointment or are called away from work due to a family emergency or illness, you are essentially out of pocket the price of cab fare. There are people who work in the industrial areas who, I am sure, would appreciate more flexible route schedules, particularly those who work flex time or part time. After having taken the MetroRail in Washington, DC, it's abundantly clear to me just how sorry our transit system truly is." "I find it so hard to go anywhere in the evening because I can never get a ride home besides a cab...and that adds up! Making the ETS run 24 hours would not only increase ridership but it would also be the best thing that they have ever done for the city! There are so many reasons that this is a good idea!" "I've gotten off work at 1:00am and started at 5:00am at different times. Begged rides helped, but neither job lasted long."